Background: Despite the therapeutic use of peptides is limited because of their metabolism in vivo, there are no systematic reviews explaining degradation of peptides by peptidases. This review summarizes peptidases present in the tissues and metabolic characteristics of peptides, and provides recent strategies for improving the metabolic stability of peptides. Method: We reviewed a number of peptidases including their functional groups, tissue localization and cleavage specificity. Given the broad distribution of peptidases in the body, several tissues, such as the liver, kidney, lung, blood, nasal epithelial cells, placenta and skin, have the capacity to metabolize peptides. We compared the metabolic characteristics of peptides in these tissues and then summarized strategies for improving peptide stability. Results: In addition to the primary organs including liver, kidney, gastrointestinal tract and blood involved in peptide metabolism, other organs such as the lung, skin, placenta and nasal mucosa may also play a role in peptide degradation. At present, the main measures to improve the stability of the peptide include N- and/or C-terminal modification or substitution, D-amino acid or unnatural amino acid substitution, cyclization, backbone modification, nanoparticle formulations and increased molecular mass. 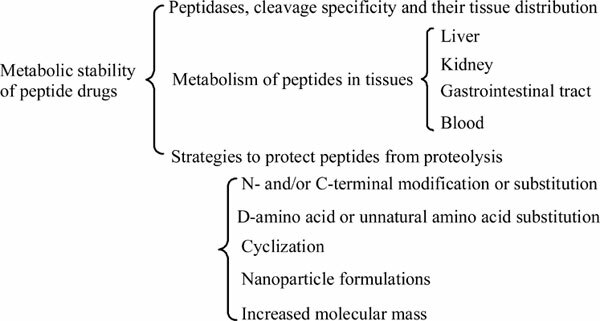 Conclusion: This review summarized the key in vivo peptidases and their tissue distribution characteristics, and presented strategies to improve the metabolic stability and bioavailability of peptide drugs. These viewpoints will benefit the further development and utilization of peptide drugs. Peptides, peptidases, metabolism, stability, bioavailability, modification.